(Text automatically translated) A few kilometers away you can catch all the natural beauty and natural scenery of the Ionian coast-Etna. The Riviera of the Cyclops, the baroque of Catania and Acireale, Taormina, the highest volcano in Europe can be grasped in no time at all since a short distance: within 35 km you can visit all the many aspects of our local context. Overall renting this place was a good choice because of many reasons. It is a nice flat even to spend leisure time in. It includes two bathrooms which is good if you're a lot of people. Flat also has magazines, toys and many appliances - which is very good if one wants to cook. This flat is not like any other flats I have rented before which were usually empty and had to buy everything from the start. It also had basic staff such as foil, stretch and seal, toilet paper rolls, plastic bags, anti mosquito spray, ice packs and many more which i found comfortable. I would say that the place is very homy. It was also very well equipped with pots and pans, plates and many utensils. One could easily cook a big meal without being afraid of not finding the right equipment. One thing that i felt very very comfortable with is the fact that Rosella and Mattia were very helpful. Having two little kids with us made me feel safe to have rented the place with such owners. I had peace of mind that should anything happen to us or the kids during our stay I could turn to them for help without hesitation. This flat also has a roof where one can bbq or chill out at night time. Roof includes deck chairs, table bbq set and so on. The fact that this place carries its own parking was also very important as the street is always packed with cars, however the place was not loud at night time and one could sleep peacefully. There was no lift and the spare bedrooms have no air conditioners. I was very pleased with this place and would recommend it to anyone. "Well...where do we start? Our week in Sicily was wonderful and this was due to many factors. Being picked up at the airport by Mattia (Rossella's son) made our arrival stress free and the lovely welcome we received from Rossella at the house was something we have not experienced before. She offered us coffee and gave us typical Sicilian food gifts such as bread, cakes, fresh pesto, parmesan cheese and a delicious bottle of limoncello! We had previously arranged with Mattia for airport transfers and to show us around Sicily. I would recommend this to anyone, as Mattia is a charming young man who looked after us and showed us the best points between Catania and Taormina, as well as around the Etna area. Unfortunately, after 2 attempts and bad weather, we were not able to go up Etna as planned, but instead Mattia took us to some beautiful places we would never have found on our own. Mattia is also far more reasonably priced than other tourist excursion companies and he picked up and dropped off at the house each day, as well as giving us a more personal experience of this beautiful island. 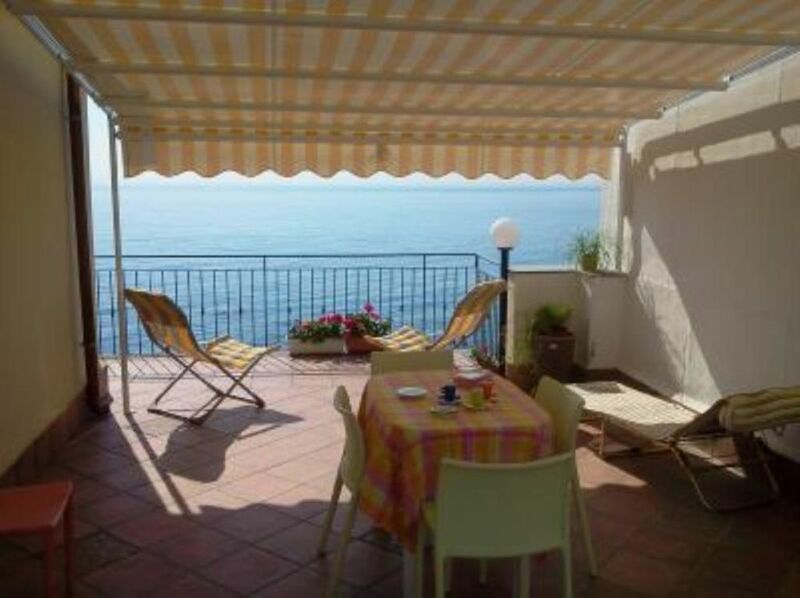 The house is very comfortable and the location to the sea is as near as you will get! The view from the roof terrace is the sea in one direction and Etna in the other! As our holiday was in February, we did not have the best of weather, but we had a fantastic week and this was due to the lovely house and the warm hospitality and attentiveness of Rossella and Mattia." "Nice house and location in a small and warmy fishing village. Excellent sea food nearby. Friendly owner and son." "Going to this place is like going to your own holiday house by the sea. All you need to do is go in, unpack and relax. It is a perfect location for couples and families alike. The owner is very friendly and welcoming. We highly recommend it! "We were very happy with the accommodation, very clean and very well furnished, lovely view, not far to small stores for groceries etc. with restaurants in walking distance. Recommended." "We found the owners very friendly and helpfull. It was a difficult time for us as we were in Sicily on compassionate grounds. The accomodation was clean and comfortable rather than luxurious.The location was supurb and quiet for that time of year which suited us perfectly. Some of the furnishings were a little tired. Tariffe scontate in relazione alla durata, Tariffe in funzione del numero di persone, , Caparra richiesta alla prenotazione, Consegna delle chiavi da parte del Proprietario .